As mid-last week may have suggested, its been a mini harvest time here at the mikehawkey.com household. Tomatoes are ripening in abundance, pumpkins (and now melons!) are getting bigger and chillies are starting to change red. We have had so many tomatoes this season that it was time to look at options as to what we can do with them. 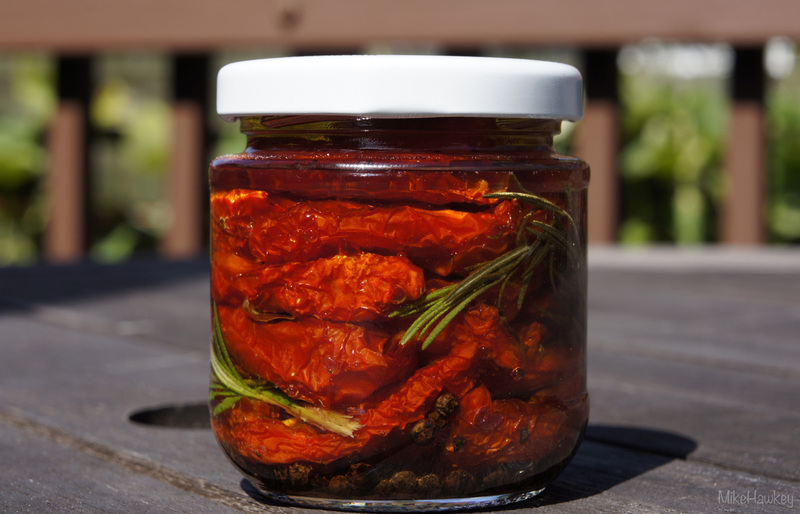 Something I have not tried before, but was keen to give a go was sun-dried tomatoes. As with many places in the world, New Zealand is not really ideal for true sun-dried tomatoes, so we borrowed our friends dehydrator to give it a whirl. Unsure if it was going to work or not, I unfortunately didn’t take any process photos. Maybe next time. Searching high and low for a recipe that had the tomatoes finishing in oil (most for health reasons suggest drying and storing in the freezer), I settled on the general instructional from Mary Ann Esposito, which adds into a process a quick dip in simmering vinegar to act as a preserving and bacteria limiting agent. place in dehydrator with enough clearance around them. dry on paper towel and pace into sterilised jar. Add some salt, peppercorns and top off with olive oil until all tomatoes are covered. I ended up storing them in the fridge, which of course has set the olive oil, but not to worry, if I pull them out the day I wish to use they will return to liquid state quick enough. I had enough over to place in a small container also. Yum! Next up is drying a range of herbs to be used in cooking. How I love sun dried tomatoes! Yours look great! Thanks. They are always a tasty treat. I could eat them every day! We should get together and have cheese and crackers and sun dried tomatoes sometime and talk photography!